We’d love your help. Let us know what’s wrong with this preview of After You've Gone by Jeffrey Lent. 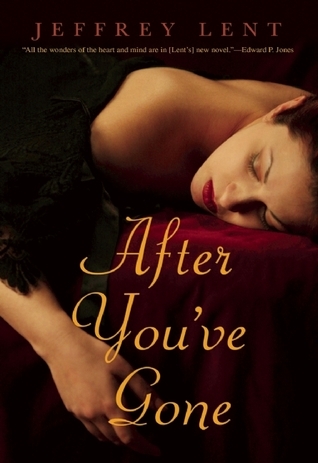 To ask other readers questions about After You've Gone, please sign up. I loved "In the Fall," and "Lost Nation" is one of my favorite books. Jeffrey Lent is still a great writer, but he just went through some mad-lib motions for this one. It felt like a rip-off of about 100 different things, most notably, a heterosexual spin on "A Single Man" meets the most depressing scenes from "The Shipping News" smushed together with the intolerable parts of "The End of the Affair." WHY DO THEY LOVE EACH OTHER, AND WHO CARES! Stop moping about wi Buuuuuuuuuuuuuuuuuuuuuuuuuuuuuh. Jeffrey Lent is still a great writer, but he just went through some mad-lib motions for this one. It felt like a rip-off of about 100 different things, most notably, a heterosexual spin on "A Single Man" meets the most depressing scenes from "The Shipping News" smushed together with the intolerable parts of "The End of the Affair." WHY DO THEY LOVE EACH OTHER, AND WHO CARES! Stop moping about with your GD cello playing, already. You're in Amsterdam. Do some drugs. Smell the roses. "In the Fall" was one of my favorite novels ever, so I approached this one with high hopes. One of the protagonist's ancestors left the Netherlands under shady circumstances, so when Henry travels back there, I expected him to begin unraveling a complex, fascinating tale in the way that "In the Fall" kept adding layers of family history. But this novel was much simpler, with virtually no surprises, and I found myself feeling disappointed. Struggled to get through this. Found myself skimming over pages. Life is precious. Life is fragile. Don't want anything too much, and just enjoy what comes your way. It was a lovely read. as with other readers, i found the sentence fragments and sparse punctuation a bit annoying. i found myself reading certain pages and paragraphs multiple times - thinking i had missed something. i like Lent's stories a great deal, well let's say i really liked In the Fall and Lost Nation. it took me a while to realize i liked A Peculiar Grace, as it was so far afield from the the other two. with After You've Gone, my like-o-meter was all over the place. the characters, other than Henry and Lydia, as with other readers, i found the sentence fragments and sparse punctuation a bit annoying. i found myself reading certain pages and paragraphs multiple times - thinking i had missed something. the characters, other than Henry and Lydia, were like sound bytes. you hear them and see them, but all you get is a mere sample. i got the same feel with plot development. if you're going to Amsterdam to look for clues and insight about your father then do it. if you mention that you did part of your education at Yale, then talk about Yale or New Haven, rather than let a line out and yank it back in before anyone has a chance to hook on. This story initially set in upstate New York in the early 1900's follows the life of a male professor at Elmira College for Women, before that time in Nova Scotia and afterwards in Amsterdam. Lent's writing about place is fully detailed and engrossing. So too if not more so is his deep insight .into his characters and his rendering of powerful character moments and feelings. These qualities caught me and impressed me deeply. However, The plot line of the book as it advances more into a romance g This story initially set in upstate New York in the early 1900's follows the life of a male professor at Elmira College for Women, before that time in Nova Scotia and afterwards in Amsterdam. Lent's writing about place is fully detailed and engrossing. So too if not more so is his deep insight .into his characters and his rendering of powerful character moments and feelings. These qualities caught me and impressed me deeply. However, The plot line of the book as it advances more into a romance genre left me wanting something finer. Perhaps this is because I am not a devoted reader of the romance genre.. I now have read reviews of his earlier novels... morally deep and some times violent.. as I read the reviews. After a family tragedy, Henry Dorn leaves his life in America behind travels to Holland, the country of his ancestors. He is no longer a husband, a father, grandfather, a college professor. He embarks on a second life so to speak. He mets a woman on the passage to Holland and they begin an affair. And when she leaves him to travel to Paris, he is afraid he has lost love for the second time in his life. They do have plans to reunite but once again, tragedy finds Henry. The story is written in seve After a family tragedy, Henry Dorn leaves his life in America behind travels to Holland, the country of his ancestors. He is no longer a husband, a father, grandfather, a college professor. He embarks on a second life so to speak. He mets a woman on the passage to Holland and they begin an affair. And when she leaves him to travel to Paris, he is afraid he has lost love for the second time in his life. They do have plans to reunite but once again, tragedy finds Henry. The story is written in several different themes-when Henry was a young man in Nova Scotia, as a newly married college professor, as a father struggling to help his son-scarred by WWI. It is a good read-I especially liked the settings of Ithaca NY and also Holland. The entire structure was very interesting. On paper I would have expected it to be annoying and disjointed, but he wove the stories together masterfully. Jumping years to tell his tale was very inventive and probably very challenging. Initially I thought it a lazy maneuver but much like short stories, a well crafted tale or story appears effortless when really it is full of effort. I was very curious how he would end it, but it fit perfectly. Poignantly. I very much enjoyed A Peculiar Grace which The entire structure was very interesting. On paper I would have expected it to be annoying and disjointed, but he wove the stories together masterfully. Jumping years to tell his tale was very inventive and probably very challenging. Initially I thought it a lazy maneuver but much like short stories, a well crafted tale or story appears effortless when really it is full of effort. I very much enjoyed A Peculiar Grace which was very different, but in both novels, he captured and wrote feelings evocatively, beautifully. Speaking for men and women equally which is a rare gift. Easy reading, flowing feeling, incredible descriptions- setting the scene, and hard to put down. I so enjoyed two other Lent books I've read so I was looking forward to this one. A disappointment. This is a sad love story; the characters are interesting, preplexing really, the main character inconsistent, in my opinion. Much of the plot is predictable, especially the end. I would like to have know the real outcome of life of the Russian cello player, The trouble of the son who returns from WWI seems real and his father's failureto understand is a little troubling. Such a good man and yet---- I so enjoyed two other Lent books I've read so I was looking forward to this one. A disappointment. This is a sad love story; the characters are interesting, preplexing really, the main character inconsistent, in my opinion. Much of the plot is predictable, especially the end. Jefrey Lent's writing style enchanted and infuriated me. Some of his sentences are a paragraph long and must be re-read for comprehension - but his use of language is beautiful. The story about a man in his late fifties is told in multiple time periods and locations. It is spare, at times mesmerizingly slow, and yet always left me wondering where the story was leading. I will read more of this author. I liked “After You’ve Gone,” but preferred Lent’s previous novel “A Peculiar Grace.” This mainly had to with the surprise ending of this novel, which I think readers will either view as fateful, or without closure. I fell into the latter category, which isn’t to say that the book wasn’t good. It just left me wanting more. The grief of the widower in this story made me stop and cry several times. His love and longing for his deceased wife was poignant. He has recently retired from his teaching job and lost a wife so we follow him in his struggles to reinvent himself. He moves to Europe, takes up the cello, goes on a cruise and meets a new love. The love story is sweet and authentic with sympathetic characters. Beautifully written (as always). Not happy with the ending, but that's not a criticism. Hard to say more without putting a spoiler out there, but I couldn't believe where Lent went with it at the end. Didn't see that coming at all. And any WOW moment while reading is pretty rare and incredible, even a bad one. But then this is one incredible author. Hope this one is better than the last which I couldn't even finish. I loved his first two books, especially In The Fall which I recommend to anyone who wants a passionate, well crafted, story of humanity. More than 1/2way thru and its marvelous. a style of writing that I could never emulate. Another ball out of the park Lent. Marvelous in a way I normally don't admire. I liked this book overall. The story is told in two time frames -- circa 1925 and circa 1890-1923. I found the writing style odd in places--he uses quite a few sentence fragments--but I was intrigued by the characters & their stories. The ending took me completely by surprise. A sad story about a man who moves to the Netherlands after his wife and son die in a tragic accident. Set in the 1920s. Lent is a gifted writer who I will continue to read on the strength of his debut novel, In the Fall. I absolutely love Jeffrey Lent's writing, this one takes a little while to figure out his going back and forth in time. It doesn't take long before it makes sense. I might have given it five stars except for the ending. I loved Jeffrey Lent's other books. This is as good. Wow. Beautifully written. The story of family, and love. Set in the early 1900s the story goes back and forth between Henry's childhood and late in his life. He does people so well. I found another favorite author. Can't wait to go to the library for a couple more of his books. I lingered over the words in this one. I think it will be in my mind for a few days. I picked it up for a "brain candy" break, but it is far from brain candy. Lent writes beautifully and captures the main character's layers and contradictions. I enjoyed this book until the end, which made me sad. I will continue to read each book he publishes, though, hoping to find one as amazing as his first, In the Fall. Harlequin romance wrapped in pretentious language. Ended like a Lifetime Channel movie. I want my time back! It took a few chapters to settle in to this, but I'm glad I did. In addition to a great story, Lent's writing is incredible. He manages to break a lot of rules and get away with it. Recommends it for: it would be difficult to recommend it. Tried to like this novel but after a number of attempts the story didn't have interest for me and the characters weren't appealing. Don't read. Not much of a story.